UX Design Doesn't Just Make Things "Pretty"
The design field is changing. A couple of years ago, I was at a design conference and one of the speakers clearly told us that design heros no longer existed. He said that designers had to move towards being a leader to create a solution. It's true. We aren't creating art. We aren't making a pretty picture. We are creating solutions to business problems. In some ways, designers are being called to take on some of the role and knowledge of an engineer. Or are we assuming the role of our first cousins, the Industrial Designer? Or are we more like an Architect for software rather than a building? Or something different? Which role makes more sense? 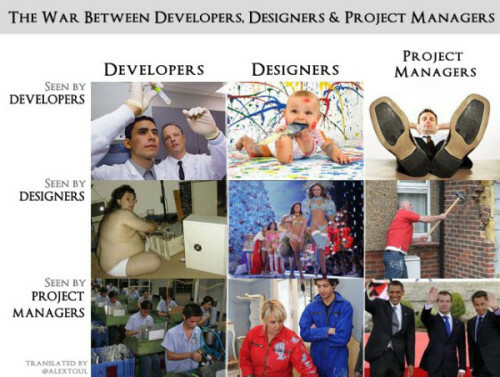 There are a number of jokes on the Internet about how engineers see designers and designers see engineers. This is probably the best one ever (See the site, Into the Painted Grey for the original. This has been passed around the Internet many times over so it is impossible to know who the real creator is.). I think this image is hilarious - and in some ways, not too far from the truth (which is probably why it is so funny!). But more and more, the role of the designer is drifting away from being the "painter," making things look pretty to become a solution creator and a type of engineer. Making a product is about preparing for the next step, always moving towards production. This preparation for that next step is where documentation and engineering happens. Most projects follow the process and phases: exploration, requirements, design, execution/production, testing, distribution. Engineers usually do their work in the exploration, requirements and design phases; construction and manufacturing works in execution and production. This is true of all industries except software - where execution and product is performed by software engineers, developers and programmers. Designers typically work lock-step with engineers in the process, preparing documents for manufacturing or development. Using this model - designers and engineers are part of the same group, defining what the product should be. Engineers use science and research to create a solution. Most engineers don't necessarilly do the actual building of a product (some know how and are able to do that, but usually they are able to leverage science to create a solution thru plans and drawings) - they create the plans to make it happen. Software is an exception, where engineers work more directly, writing code (plans) to optimize data flow. Traditionally, engineers think in terms of optimizing; designers think in terms of attractiveness. However, in today's world, the market doesn't support a clear separation between the two - consumers want well-built, good looking products with optimized efficiency. An engineer has to have some design-sense, and a designer needs to have some engineering sense. Apple could be considered a trailblazer with this concept - creating something that works well and is well designed. Martha Stewart also strengthened this concept, along with Ikea making something well-designed and fairly well-built, affordable. ISO 9241-210 defines user experience as "a person's perceptions and responses that result from the use or anticipated use of a product, system or service". According to the ISO definition user experience includes all the users' emotions, beliefs, preferences, perceptions, physical and psychological responses, behaviors and accomplishments that occur before, during and after use. The ISO also list three factors that influence user experience: system, user and the context of use. A UX designer is solving social problems - the core problem of how a user interacts with a system. To sum it up, he is designing a system. Given the earlier definition of an engineer - I think on this alone, we could safely say UX is less about design and more about engineering, but let's look at some other examples. This is a lively debate in all fields. There is an article at MCA Cafe that outlines the difference between the design and engineering disciplines so that people who are hiring a designer or engineer know what they are getting (summary: engineer makes it work; designer dresses it up). There are a number of forums as well that continue this debate. The engineer makes sure that the product can be manufactured; the designer makes sure that it not just looks good, but it's ergonomic, usable, marketable, sellable, etc. With these statements and the definition of engineering, one has to ask: are ergonomics, human factors, and usability indeed engineering? Isn't it beyond design and "dressing things up"? However, is separating design and engineering really all that easy? Making something marketable means that you need to understand the market and have a handle on its sociology. Many "designers" I know have a deep knowledge of psychology, sociology, and social research methodologies. Engineers, by definition, work with materials, but they also work with the "softer," people sciences (creating workflows, optimizing how companies operate). This makes the successful design of workflow and interfaces a form of engineering. UX Design is a close first cousin of Industrial Design - it could be considered Industrial Design of the Web/Mobile/Software. Industrial designers work with engineers to create new products. However, industrial designers must have an understanding of the technology when designing. They need to understand what materials can do - how much they can bend, how compact a chip can be to achieve better usabiiity and ergonomics and aesthetics. They need to understand the psychology of people who will use a product and what the product will be used for. By working closely with an engineer, the designer learns more and more about materials and capabilities, giving a broader understanding of what's possible. But sometimes the engineer needs to determine how the form of an object could change - smaller, rotate, etc. - to make a better design. There may be something about the material or object that only the engineer will know. This makes the designer/engineer working relationship really a partnership. Maybe this relationship should be redefined with the Industrial Designer being the "people engineer" and the Design Engineer being the "materials engineer." For optimizing the process - the traditional "Designer" may suggest that the process flow one way to make it better for users based on what they need, and the traditional "engineer" would figure out how to get the chip or information to do that in a optimal way. Considering this, both are engineers - just different focus. An architect creates a vision for a building or structure. He understands about materials and design and how they can work together. He develops an initial sketch and various architects and engineers at a firm complete the work. They consult with construction teams to learn what's feasible. In some ways, the process is similar to product design - there is a team working on a project with different areas of focus. Where it is different is that the architect, in some ways, is a hybrid of the traditional engineer and a designer. He needs to understand who will be using his structure, why, and how he will interact with it. He needs to understand materials - not in detail (that's a structural engineer) - but enough to create a sketch of something that can be built. Is the architect an engineer? Well, architecture is offered in many engineering and design schools. The architect needs to understand science and art and people. The architect also has to understand psychology and sociology in order to desgin a great building. The UX designer is very similar to the architect - they could be considered cousins as well (not first cousins, but cousins). Both need to understand technology, design, art, sociology and psychology. The difference is that architects create a vision and lead a project team to bring this vision to completion; UX designers rarely own or lead a vision to completion (typically that role goes to the business in the form of a product manager). This is why UX is closer to engineering than architecture. Architects oversee a vision; UX is part of a team creating a product responsible for the how the user's will interact with a system. Given all of the definitions above, that defines an engineer that's focused on people using an optimized system. It goes well beyond design and making things "pretty." I guess based on this, the discipline of User Experience Design is a type of engineering. I'm curioius to hear your perspective. Please share in the comments.